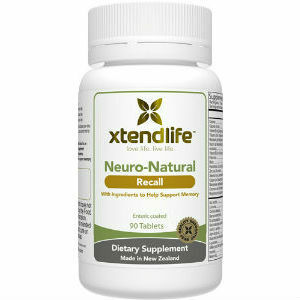 This is our review of the Xtendlife Neuro-Natural Recall supplement. The manufacturer states the product is meant to help with your memory recollection, cognitive function, and also supports the brain and promote healthy brain activity. They also state the natural process of aging doesn’t necessarily need to lead to loss of memory which is why this product was created. Please keep reading this review if you are interested to find out more about the product and its claims. This product does not contain dairy, peanut, shellfish, or gluten. For adults, the recommended serving size is 6 tablets. Children who are 16 to 18 years of age should take 4 tablets. Children who are 12 to 15 should take 3 tablets. Ages 10 to 11 should take 2 tablets. For best results, split the tablet in half and take one serving in the morning and the other half at night. Women who are pregnant or nursing are recommended to speak with their doctor first before using this product. If you have any questions or concerns, it is always ideal to wait till you are cleared by your doctor to take any dietary supplement. Non-member price for this bottle is $42.50. The member price is $38.25. A new customer can make a free account to get the discounted price on their second order. There is also an auto ship option available for this product as well. Customers who try this product can try it risk-free for a full year. If they are not satisfied with results you can simply send back all the bottles used and unused before a full year back to the manufacturer for a refund or product replacement. The reviews for this product are very positive. It seems this product has been living up to customer’s expectations. Though, while all of them are positive, there are only a handful of reviews. The Xtendlife Neuro-Natural Recall supplement generally seems to be a solid product. It has a full year guarantee and also provides a discounted price for its members. However, even though the product is discounted, it can be a higher price threshold than some people are willing to pay for. The only other thing to note is the lack of reviews. There are only a handful of reviews and while they are positive, a number of reviews can be the deciding factor for a new customer. Henry Costa	reviewed Xtendlife Neuro-Natural Recall	on November 19th	 and gave it a rating of 3.5.